“How much will I make?” This is likely the first question and largest determining factor that prospective talented teachers will try to determine before they choose their next school district employer. School districts that lead their local market in wages proudly flaunt starting salaries and their willingness to pay more than competing districts, while those who lag their local market often find themselves trying to find creative ways to compensate for lower pay. While evaluating teacher compensation on salary alone seems logical, school leaders may find they can attract top teachers more effectively by marketing the Total Rewards benefit in school districts. What is Total Rewards in School Districts? Communicating the Total Rewards in school districts is the process of aggregating every aspect of the district’s monetary and non-monetary benefits. Total Rewards markets, and deliberately integrates strategic elements of the school district’s compensation, benefit, employee development, work-life balance, and employee recognition programs. The overall goal is to clearly demonstrate the combined value of these programs for employees the district is attempting to recruit as well as demonstrating how the district is investing in current employees. 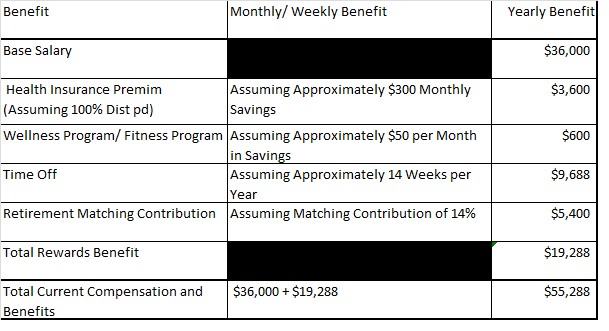 Before you say, “We already have webpages that discuss all aspects of salary or benefits in one way or another,” read further to see how marketing the combined value of a school district’s Total Rewards is not the same as providing bullet points of the various benefit programs a school district offers. When valued employee rewards exist in individual compartments it can be difficult for employees to realize their combined value. 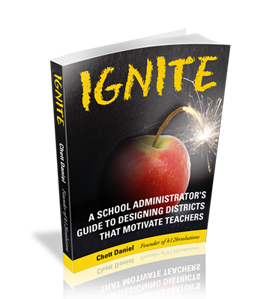 An effective Total Rewards program in school districts is a proprietary strategy the district can use to not only attract, but also retain and motivate school district employees. Compensation– Regardless of other reward programs a district offers, compensation is likely the center piece of any district’s Total Reward program. Compensation can take many forms. Typical compensation programs offered by school districts are salary, extra duty or stipend pay, district paid retirement, and, in some cases, districts have begun to offer incentive pay as well as housing assistance (either as a direct subsidy or through school district provided housing). Compensation can also include signing bonuses for difficult to fill positions. Benefits– After various types of monetary compensation, employee benefits are likely the next most valued employee reward. Medical or health insurance is likely the most essential component of benefit programs. 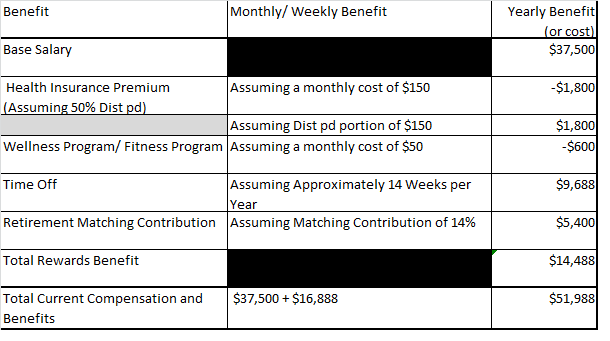 When communicating total rewards for teachers, districts should discuss if all, or a portion of employee health insurance premiums are paid by the district. The district should also discuss premium levels for spouses and children as well as deductible and maximum out-of-pocket expenses. If a particular school district pays slightly less than a neighboring district, but covers 100% of employee insurance premiums, and have lower deductibles, the district helps prospective and current employees make fair comparisons in actual wages when accounting for out-of-pocket expenses associated with insurance. Besides medical insurance, many school districts also offer important health benefits such as preferential access to in-network physicians either through office visits or through some type of phone or online platform, dental insurance, sick leave pools, vision, cancer, and life insurance. Additional programs that may also be included in Total Reward programs for school districts may include wellness programs, such as district paid or provided fitness amenities, on-site daycare, and out-of-district tuition forgiveness when staff members live outside the district, but their children attend school within the district. Work-Life Balance– If your other reward factors are equal, or at least competitive, work-life-balance rewards are often overlooked, but can be highly valued among certain employees and may also be related to increased levels of employee engagement. The first and most obvious factor in work-life balance is time off. While summer, holiday, and spring break are obvious elements of time off of work for most districts, many smaller districts have begun to compete for talent with their higher paying neighboring districts (while also reducing operational expenses) by shortening the school week and giving teachers an extra day off each week. Other important, but often overlooked Total Reward element in school districts is increased autonomy. Greater autonomy increases employee engagement and allows teachers more control regarding content selection and instructional practices. Personal and Career Development– If veteran teachers want to remain competitive for jobs in the educator marketplace, they must continually develop their skill set to include a wide range of competencies related to teaching with technology, educating diverse learners, and aligning instructional content to a variety of standards (these are just a few of the many factors where teachers must develop themselves). Professional development is often overlooked as an important part of the Total Rewards package, but for the long term viability of a teacher’s career, it can be one of the most important factors for the teacher and for the school district. Through district paid professional development teachers not only make their own teachers more effective, but they also increase the potential value or attractiveness of the teacher as a job candidate should they ever choose to leave the district and pursue employment in another district. Performance Recognition– Performance recognition can look very different depending on how districts decide to reward their top performers. Some districts have adopted incentive “pay-for-performance” plans (these are not without controversy). Even so, many states have begun to fund performance incentive plans. When districts offer some type of performance recognition, whether it be monetary, or non-monetary, school districts should incorporate any type of valued performance recognition as part of Total Rewards in their school district. Now that you have a clearer idea of what Total Rewards in school districts looks like, examine the difference it can make in communicating the personal financial advantage of working for one particular school district over another that, at first glance, appears to pay more in salary. Imagine a local school district that has a base salary of $36,000 per year and covers the entire cost of personal insurance premiums and offers a generous wellness program. Now picture a neighboring school district that pays beginning teachers $1500 more per year in base salary, but they don’t advertise that employees are responsible for a portion of their personal insurance premiums. When prospective talented teachers compare the salary of $36,000 per year to $37,500, it would seem logical for most to choose the district with a higher base salary. Upon closer examination, a prospective teacher may want to peel back a few layers to see what their actual wages would be. Use the table below assuming the beginning salary of a teacher earning $36,000 per year. Now compare the Total Rewards from the seemingly lower paying district above that pays 100% of insurance premiums for employees to the seemingly higher paying district below that only pays a portion of insurance and provides no wellness benefits. As you can see, the district that advertises a higher base salary actually provides significantly less when you factor in Total Rewards. The tables above attempt to demonstrate some of the most basic benefits many school districts across the country provides and how comparing one district to another on the basis of starting salary alone can, at times, be very misleading. Clearly demonstrating the value of Total Rewards can be a powerful tool in recruiting and retaining talent in education. As you can imagine, this article only scratches the surface regarding Total Rewards and how they can be utilized in a school district’s talent management strategy. As organizations in different industries have found, various rewards are valued differently depending on the career field and age group of the employee. Districts that want to attract experienced teachers that are looking to start families and establish roots in the area may choose to offer maternity/paternity benefits. Other districts may choose to reward more veteran teachers and encourage conservative use of sick and personal days by providing a “buy back” program for unused leave days at the end of the school year, segments of five years, or the end of a teacher’s career. If a school district has not yet developed a total rewards strategy, it may be useful to first identify which rewards employees value the most and ensuring they are key elements of the Total Rewards package utilized in the school district. If your district needs assistance developing a Total Rewards plan, or any other aspect related to human resources in school districts, contact a member of the K12 HR Solutions team and we will be happy to assist you. Utilizing Total Rewards in school districts can be an effective tool to recruit and retain effective teachers and allow current and potential teachers to make fair comparisons regarding compensation and benefits that are most important to them.